Mahindra has launched the new Alturas G4 SUV with prices starting from Rs 26.95 lakh (ex-showroom Delhi). The seven seater SUV, which is based on the Ssangyong Rexton G4 offered in global markets, goes up against body-on-frame SUVs like the Toyota Fortuner, Ford Endeavour and Isuzu mu-X in India. Here's how it fares against these SUVs on paper. The Mahindra Alturas G4 is significantly wider than its rivals. It's also taller, but that takes the roof rails into account. The Mahindra also has the longest wheelbase and the best ground clearance (unladen) in this comparison. The Toyota Fortuner is the shortest and narrowest SUV here. It also has the shortest wheelbase (at least 100mm less than others). The Alturas G4 is powered by the same 2.2-litre engine as the Rexton. While it is at par with other SUVs in terms of power output, it is not the torquiest. The numbers game in the performance department goes to the Endeavour. Its 3.2-litre engine makes the most power and torque. 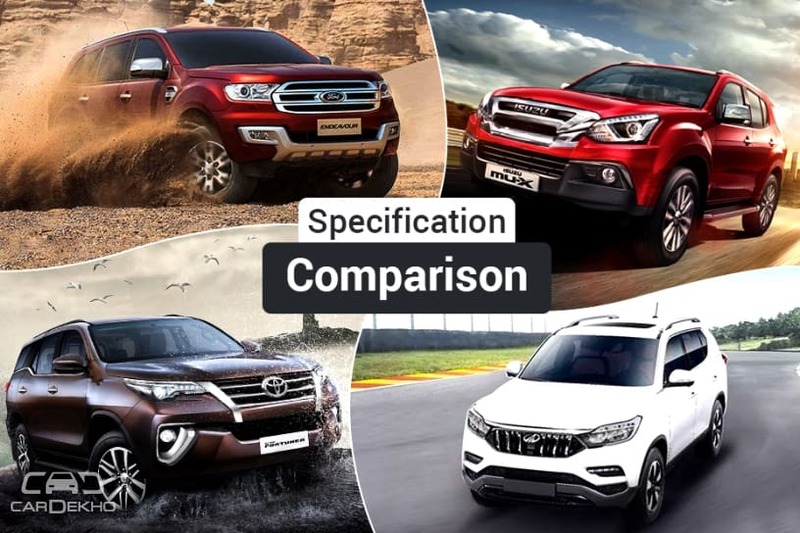 All the SUVs in this comparison are available with both 2WD and 4WD drivetrains. Standard features: A lot of comforts and features are on offer across all the models in this comparison. This includes electrically foldable and adjustable ORVMs, touchscreen infotainment systems of varying sizes, climate control with vents and controls for the second row of seats which can be split folded 60:40, power-adjustable driver’s seat, steering-mounted audio controls and cruise control. Seating: The Mahindra Alturas G4’s second-row of seats have a recline function but do not slide. They can be folded 60:40 split and can be tumbled forward to access the third row of seats. The final row of seats can be split-folded 50:50 or flat down to offer more luggage space when not in use. In the Isuzu mu-X the second row seat has a one-touch tumble feature for ease while in the Endeavour, the second row seats have a tip and slide mechanism to get into the last row but they do have the ability to slide and recline. The third row of both the Isuzu and the Endeavour can be split 50:50 and folded flat for more boot space. The Ford’s last row folds electrically unlike the Isuzu. In the Fortuner, the second row seats do have one-touch tumble functionality along with the ability to slide and recline. Even the third row seats can recline in the Toyota but no split folding ability is mentioned. Safety: All cars here come fairly well equipped in terms of driver and occupant safety even if they’re not packed with tricky driver assistance technology. They all have ABS with EBD, hill start assist, traction control, electronic stability control and hill descent control as well. The Alturas G4 offers a safety feature missing is an ISOFIX child anchorages in the big Ford, but it is offered in all the others. Rear parking sensors and a rear-view camera are available on the Alturas G4, Fortuner and Endeavour but is not listed on the mu-X. segment leading nine airbags, while the Fortuner has second airbags. The mu-X offers six airbags whereas the Endeavour in base spec only has dual front airbags, six airbags in the middle variant and seven airbags in the top-spec. The only safety feature missing is an ISOFIX child anchorages in the big Ford, but it is offered in all the others. Rear parking sensors and a rear-view camera are available on the Alturas G4, Fortuner and Endeavour but is not listed on the mu-X. Infotainment: The Mahindra Alturas G4 gets an 8-inch touchscreen infotainment unit with a 6-speaker sound system and Android Auto and Apple CarPlay compatibility. The global-spec Rexton on which it is based features a 9.2-inch screen and up to 10 speakers .The Ford Endeavour has a touchscreen infotainment system for navigation, SYNC with voice control that is compatible with Android Auto and Apple CarPlay, as well as a 10 speaker sound system. The Toyota Fortuner has a 7-inch touchscreen infotainment display that is connected to a 6 speaker sound system. The 2018 Isuzu mu-X now gets a 7-inch touchscreen infotainment unit with an 8 speaker sound system but there’s no mention of Android Auto or Apple CarPlay compatibility. Comfort and Convenience features: The Mahindra Alturas G4 gets ventilated front seats, dual zone climate control with blowers in the second and third row, rain-sensing wipers, front and rear parking sensors, 360° surround view camera and the smart automatic electric tailgate. It even has a feature called the ‘easy access mode’ which moves the front seats backwards when you open the door. Meanwhile, the Toyota Fortuner gets dual zone automatic climate control and an electric tailgate with a memory function and jam protection. The Mahindra Alturas G4 offers an electric tailgate functionality along with dual-zone automatic climate control. But it is the top-spec Ford Endeavour that boasts of the most goodies, including an electric panoramic sunroof, electric tailgate and semi-auto parallel park assist as well to identify empty parking spots and turn in automatically. The mu-X has climate control with cabin vents for all three rows and separate blower controls for the second row of seats and the fewest features of all these SUVs. Off-road ability: All cars here share a common trait: a 4x4 drivetrain with off-road capabilities. The mu-X and the Fortuner also offer high-range and low-range gearbox settings and both can switch between 4WD and 2WD on the fly. The Endeavour also gets a range of off-road modes that could be selected via the terrain management system. Like before, the Isuzu mu-X seven seater SUV is the most affordable of the current competition while offering the most equipment as standard for that price. The Mahindra Alturas G4 is priced higher with a lot more features as standard, but it is the Fortuner that’s still the most expensive of these premium SUVs.